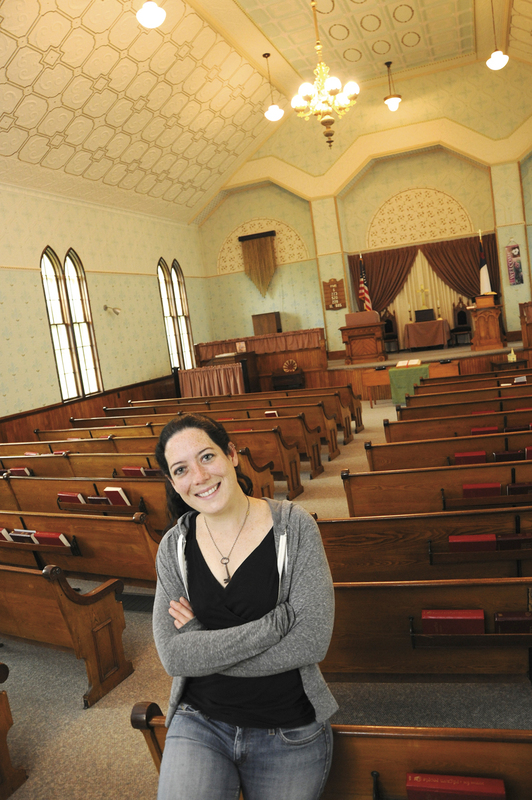 Mae Williams ’14G and the interior of the beautiful Bath Congregational Church she helped to get listed on the NH Historical Register. Jon Gilbert Fox photo. Below, she writes about one course that was especially meaningful to her, Sustainability and Historic Preservation, which allowed her to explore environmentally responsible historic preservation solutions to real-world challenges. I was particularly drawn to the Sustainability and Historic Preservation course because of my background. I grew up in a passive solar house, built by my architect father with the aid of a Carter Administration grant. My parents raised me in a household with a large, organically farmed garden and fostered my love of the natural world. After earning my undergraduate degree in art history, I found myself struggling to find a niche where I could couple my interest in sustainability with my love of history. I spent time in the curatorial department at Canterbury Shaker Village and as a program assistant for the Division of Historical Resources. I worked for the New Hampshire Department of Agriculture and then for a local non-profit conservation group. The historic preservation program, and in particular this course, finally seemed to offer me a way to blend these two seemingly disconnected worlds. The Sustainability and Historic Preservation course focused on how we can use historic preservation as a tool not just for climate change mitigation but also as a way of creating economic growth. As our climate changes, and the way in which we use space evolves, it is important to seek creative solutions to space needs while respecting not only our built environment but also the energy embodied in existing infrastructure. In this light, preservation shifts from the limited realm of local historical societies to common sense policy. Historically, towns and cities were densely packed with mixed-use walkable neighborhoods. Outside these dense centers were large tracts of farmland and forests, providing for the urban areas. Our modern world is reliant on automobiles to shuttle us around suburban shopping malls that are gradually spreading farther and farther away from town centers where vacant shops sit neglected and forgotten. Historic preservation is often viewed as an elitist and expensive venture, but in reality it can be a tool to create local jobs and a sustainable economy. Compared to similar-scale new construction, historic preservation creates more jobs. 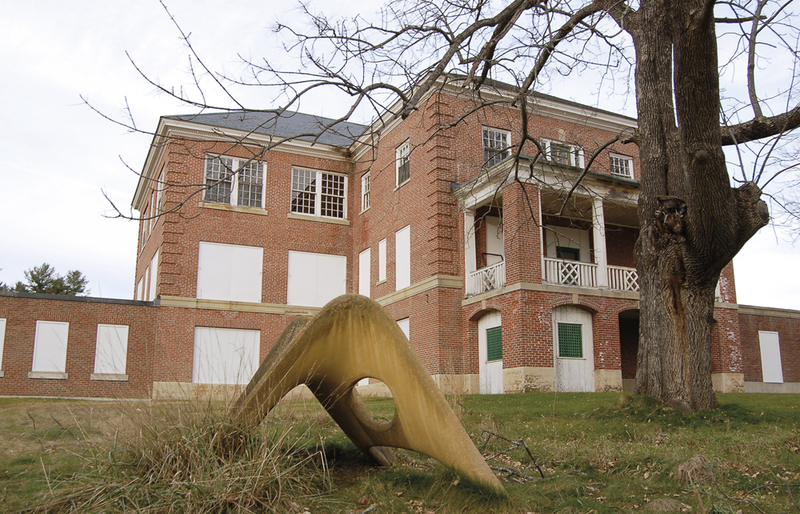 Preservation is extremely labor intensive and requires less material than new construction. A higher percentage of project costs can go directly to local craftsmen. For this class, I spent a lot of time researching the Laconia (NH) State School property and exploring some of the options for the future of the site. The course material had to be applied to identify specific obstacles and opportunities associated with the site, as well as research into how similar sites have been addressed elsewhere. In particular this course made us look past preservation as simply a collection of theories as we took those ephemeral concepts and applied them to a real-life scenario. The Baker Building, Laconia State School. The location has been largely vacant since it was formally closed in 1991. Mae Williams photo. Laconia State School is a site that faces many challenges. The campus is vast, with 222.4 acres and 33 buildings and structures. The location has been largely vacant since it was formally closed in 1991 and the empty buildings have deteriorated rapidly. The site has environmental issues, including buried oil tanks, the potential for pesticide and insecticide leachage near some of the outbuildings, solid waste, asbestos, sludge beds related to a former sewage treatment plant, lead paint, mold, and PCBs (manmade organic pollutants). Additionally, Laconia State School is associated with an era of our history that we may not want to remember, where the mentally ill were sometimes mistreated and kept separate from society. Any potential redevelopment efforts must be sensitive to this. Many states and municipalities throughout the country struggle with what to do with similar properties. The land for Laconia State School was originally chosen because of the woodlot and farming potential to create a self-reliant community. Like many similar campuses, Laconia State School has its own electrical steam plant to supply heat to most of the buildings. All buildings on the campus are currently connected to PSNH electrical service, Winnipesaukee River Basin Program Waste Water system, and city drinking water. Many of the buildings on the campus are brick and concrete, materials that are generally less expensive to renovate than wooden structures. Reuse of the site must utilize these features to be sustainable. Across the nation, other former mental institutions are slowly being transformed into mixed-use communities with residential and commercial areas. The Lakes Region Community College and Belknap County Economic Development Council have suggested that the site be used as an educational complex. Perhaps Laconia State School could be renovated in a phased development that utilizes these structures and the farmland on which they sit, returning much of the land to its historically intended use. Future use of the site might incorporate the community gardens just across the street, creating a community outreach program to teach sustainable gardening and the use of seasonally available foods. As a twenty-first-century preservationist, I know I will find myself facing similarly complex issues over and over again. I will need to constantly re-examine new studies on the economic and environmental impact of preservation as I try to convince the world that preservation is green. This course, in particular, helped me bridge the gap between the important preservation theory presented in other classes and the daily application of those concepts. Now I feel more able to explain why preservation is important to our society as we move forward. Mae Williams ’14G presented her paper, Creating a Sustainable Future for Laconia State School, at the 2013 New Hampshire Preservation Alliance’s conference.